1. Heat up the oil in karahi (Haandi). Add onions (they shouldn't be chopped instead, cut it into four pieces and remove the layers one by one as shown below). After a one minute gap add green chilies, garlic, capsicum and ginger. Cook it for about 2 minutes. Note: Do not over cook. 2. Add half tea spoon of salt and half tea spoon of garam masala. Cook it for a while. 3. Add Paneer into the ongoing tempering ingredients and sprinkle chilli sauce to give it a spicy flavor. 4. Next pour the black sauce. 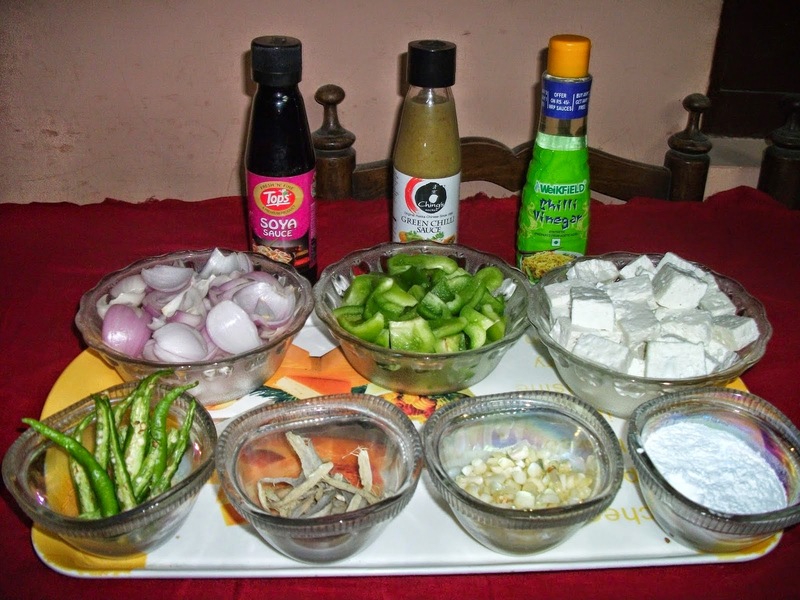 To prepare black sauce take cornflour and soya sauce as per the quantity mentioned above and stir it well. Add vinegar to it. 5. Pour the black sauce over the paneer and cook it for about 2 minutes. A beautiful aroma will diffuse into your kitchen in no time, which means Delicious Chilli Paneer is ready to serve. #1: You can also use chings chilli paneer masala to make it even more scrumptious. 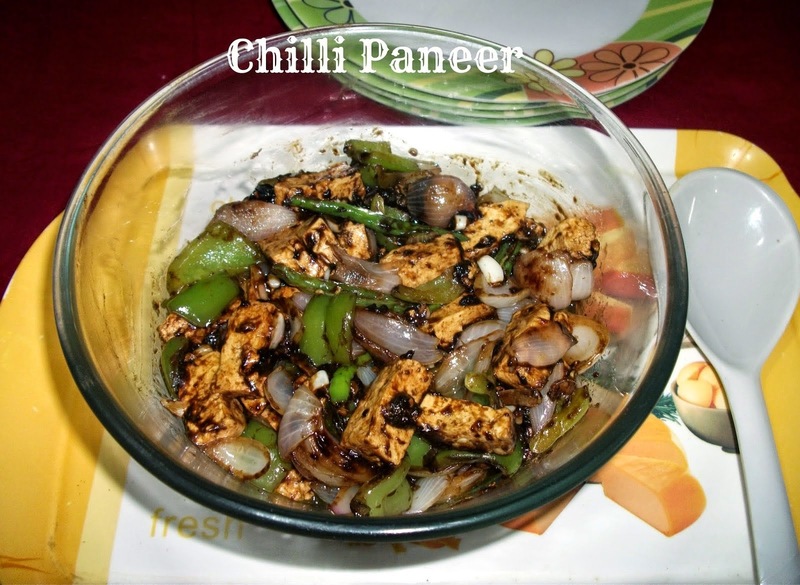 Chilli Paneer, is a popular dish in South Asia, particularly in India, though it is originated in China. That's a great news to us. 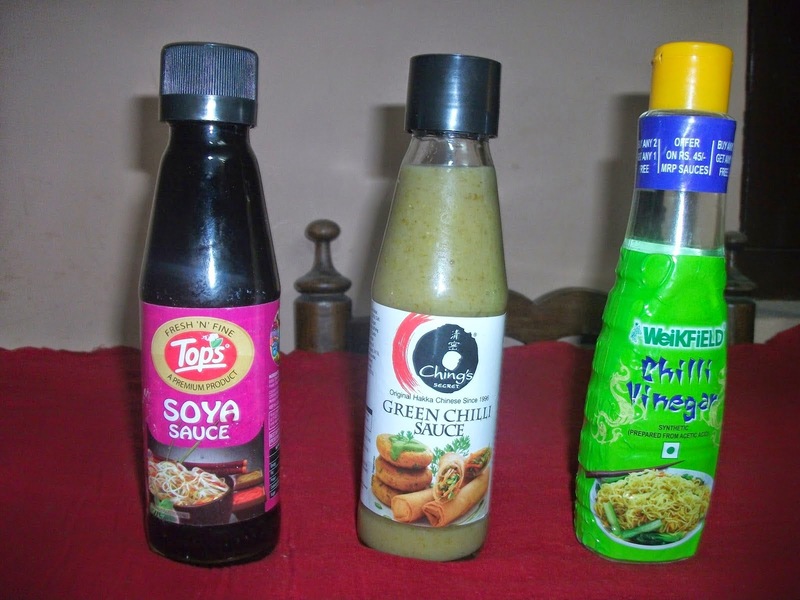 I am very glad to know that our blog "Vinayaka's Kitchen" caught your attention with the quality of our recipes. We will surely work hard to keep up the expectation and yes, we will join Recipes.in surely. Thank you for the invitation. Thank you so much Sulaiman. Have heard a lot about your writing from Sarav.. Stay around! Yum yum...my husband cook in the same way..looks delicious..
Yummy dish. I will ask Vidhya to try this one for sure. Thanks for visiting Valli :) Stay around!